OMG Posters! » Archive All Tomorrow's Parties Poster by Shepard Fairey (Onsale Info) - OMG Posters! Wow, these festival promoters are doing something right, that’s for sure (see the Tim Biskup post below too). 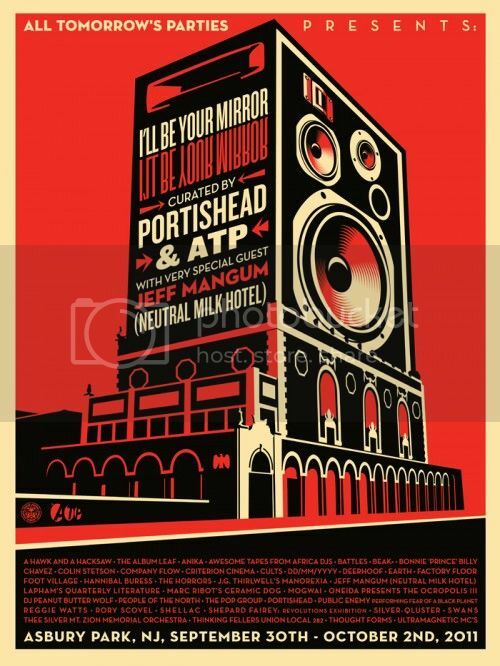 Shepard Fairey’s ‘All Tomorrow’s Parties’ poster is an 18″ x 24″ screenprint, has an edition of 600, and will cost $50. It goes up today (Thursday, September 29th) at a random time. Visit ObeyGiant.com. that is an unreal line up! poster is ok.
Yeah, what’s up with Mogwai canceling AGAIN??? ’08, ’10 and now ’11 tour…drummer OK?